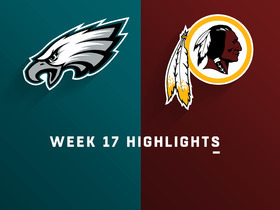 The Eagles traded for DeSean Jackson (Achilles) to join Jeffery (ribs) and Nelson Agholor at wide receiver, John McMullen of 97.3 FM ESPN South Jersey reports. Jeffery played with fractured ribs during Sunday's divisional-round loss to New Orleans, Ian Rapoport of NFL Network reports. Analysis: An MRI reportedly revealed the injury earlier in the week. The receiver wasn't on the injury report at all heading into the Eagles' wild-card victory over the Bears, but Jeffery was listed as a limited participant in every practice leading up to Sunday's loss to the Saints. Under contract with Philadelphia through 2021, Jeffery shouldn't have a problem returning to full health before the start of OTAs this spring. Jeffery brought in five of eight targets for 63 yards in the Eagles' 20-14 divisional-round playoff loss to the Saints on Sunday. Jeffery (ribs) doesn't have a designation for Sunday's divisional-round contest at New Orleans. Analysis: Although Jeffery was listed as limited all week, he's been cleared to play through a rib issue. He'll be looking to exploit a Saints defense that allowed 9.2 yards per target and 20 touchdowns to wide receivers in 2018. Jeffery (ribs) was a limited practice participant Thursday. Analysis: Despite logging a second capped session in a row, Jeffery doesn't seem to be in any danger of missing Sunday's divisional-round game at New Orleans. Assuming he ditches the rib injury on the final practice report of the week, he'll look to lead the Eagles in receiving again after a 6-82-0 line on nine targets this past Sunday in Chicago. Jeffery was listed as limited on Wednesday's estimated practice report due to a rib injury. 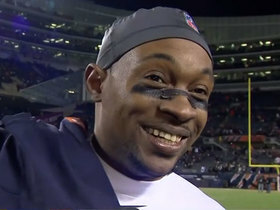 Jeffery caught six of nine targets for 82 yards in Sunday's 16-15 wild-card-round win over the Bears. Analysis: Jeffery once again displayed excellent chemistry with quarterback Nick Foles, pacing the team in targets, catches and receiving yards. Playoff poolies can expect another strong performance from Jeffery in the divisional round against a Saints team that's had trouble covering wide receivers. Jeffery caught all five of his targets for 59 yards and a touchdown during Sunday's 24-0 win over the Redskins. Jeffery caught three of five passing attempts for 82 yards in Sunday's 32-30 defeat of the Texans. Jeffery (illness) doesn't have an injury designation for Sunday's game against the Texans, Tim McManus of ESPN.com reports. Analysis: Jeffery still felt sick after returning to practice Friday, but he told McManus that he plans to suit up Sunday with his team's season on the line. While his availability is no longer in question, the veteran wideout may be impacted in terms of snap count and/or effectiveness if his symptoms don't clear up before Sunday's 1 p.m. EST kickoff. Jeffery will try to continue his chemistry with Nick Foles after exploding for 160 yards last week. Jeffery (illness) will take part in practice Friday, Eliot Shorr-Parks of Sports Radio 94 WIP Philadelphia reports. Analysis: Jeffery sat out the last two days after falling ill but will finish the week back on the practice field. The 28-year-old's level of participation remains to be seen, but he's at least trending in the right direction for Sunday's game against Houston. The Eagles' official injury report will reveal whether Jeffery carries an injury designation for Week 16. Jeffery (illness) was held out of practice Thursday, Zack Rosenblatt of NJ.com reports. Analysis: This marks back-to-back absences for Jeffery, who is coming off a season-high 160 receiving yards in a Week 15 win against the Rams. He'll have one more opportunity to get in some work at practice this week, at which point his listing on Friday's injury report will forecast his odds to suit up Sunday versus the Texans. Jeffery missed Wednesday's practice due to an illness, Zach Berman of The Philadelphia Inquirer reports. Jeffery hauled in all eight of his targets for 160 yards in Sunday's 30-23 win over the Rams. Jefferey secured six of nine targets for 50 yards and a touchdown in Sunday's 29-23 loss to Dallas. 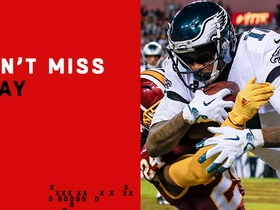 Analysis: Carson Wentz didn't post gaudy yardage totals, so Jeffery's 50 yards and six receptions both led all Philadelphia receivers. The veteran's production had really slowed following his hot start to the year, as this was the first game in which he either recorded a touchdown or reached the 50-yard mark since Week 7. While this performance was a step back in the right direction, Jeffery will draw a tough assignment matched up against Aqib Talib in Week 15's matchup with the Rams. Jeffery caught three of five passing attempts for 31 yards in Monday night's 28-13 win over Washington. Analysis: Jeffery has drawn more than five targets just once over his last five games and has not surpassed 48 yards or scored in any of those weeks. He also has seen just one red-zone target in that time after seeing nine in his first four games. The 28-year-old should not be counted on for a sudden increase in production during the fantasy playoffs, especially since a road matchup with the Cowboys' third-ranked defense against wide receivers is on tap Week 14. Coach Doug Pederson said the Eagles have been making an effort to keep Jeffery involved on offense, Mike Kaye of NJ.com reports. Jeffery caught all three of his targets for 39 yards in Sunday's 25-22 win over the Giants. 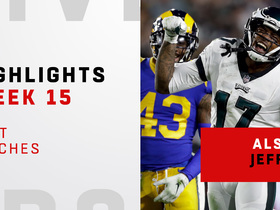 Analysis: Owners hoping for a repeat of Jeffery's Week 6 performance against this opponent (eight catches for 74 yards and two touchdowns) were left sorely disappointed. Jeffery has gone cold with fewer than 50 yards in each of the past four games, so using him against the Redskins in Week 13 will be a risky proposition. Jeffery caught four of five passes for 33 yards during Sunday's 48-7 loss to the Saints. Jeffery caught four passes (eight targets) for 48 yards in Sunday's 27-20 loss to Dallas. 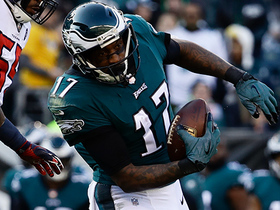 Philadelphia Eagles wide receiver Alshon Jeffery chats with NFL Network's Tom Pelissero about the importance of beating his old team and what he expects in the divisional matchup with the Saints. 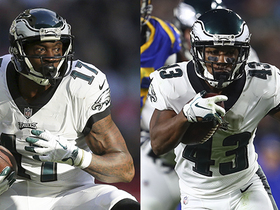 NFL Network's Shaun O'Hara highlights two players who could be the difference makers for the Philadelphia Eagles vs. the Chicago Bears. 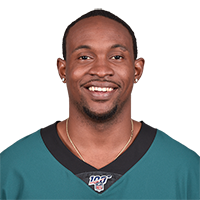 Philadephia Eagles wide receiver Alshon Jeffery bounces off tackler for 52-yard catch and run. 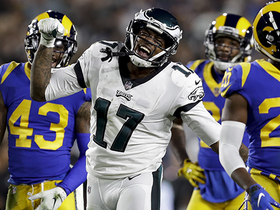 Watch the best plays from Philadelphia Eagles wide receiver Alshon Jeffery in his Week 15 matchup against the Los Angeles Rams. Philadelphia Eagles quarterback Nick Foles unloads HUGE deep ball after Los Angeles Rams' defensive breaks down. 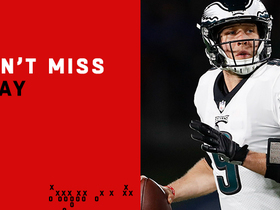 Philadelphia Eagles quarterback Nick Foles unloads HUGE deep ball after Los Angeles Rams' defensive breakdown. Philadelphia Eagles quarterback Nick Foles completes a pass to wide receiver Alshon Jeffery for a 26-yard gain. 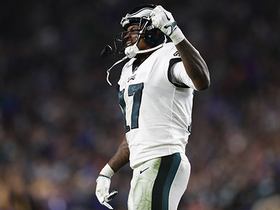 Philadelphia Eagles wide receiver Alshon Jeffery climbs imaginary ladder for leaping 35-yard grab.